The government expects to reduce coconut scale insect infestation to moderate levels in nine hot spot areas by April, an official of the Office of the Presidential Assistant for Food Security and Agricultural Modernization (OPAFSAM) said Wednesday.“We will now focus in hot spot areas,” OPAFSAM Undersecretary Fredelita Guiza said in a press conference in Quezon City. There are still some 625,000 trees that are severely infested by coconut scale insects – popularly known as cocolisap – in the following municipalities: Balayan and Calaca in Batangas, Bay and San Pablo in Laguna, Candelaria, Mauban, Sampaloc and Polilio in Quezon, and Isabela in Basilan. “Ito na lang ang tututukan for the next several months… Ang target natin, hopefully, April matatapos natin… from severe to moderate na,” she said. In June 2014, there were 58 municipalities identified as hot spot areas that were heavily infested by cocolisap. Guiza said the infestation was reduced to moderate from severe levels, those low levels those areas that were moderately infested. “Hindi na outbreak level, manageable level na,” she said. Guiza said the Integrated Pest Management (IPM) protocol is a science-based protocol crafted “to reduce CSI population and prevent its spread.” It was launched in June last year. The IPM protocol involves harvesting fruits from infested trees, injecting trunks with systemic insecticide, spraying of organic insecticide, releasing bio-control agents, and fertilization. 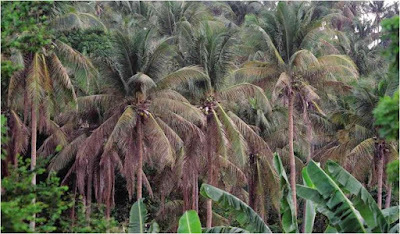 The government successfully prevented cocolisap infestation from spreading to Bicol and mainland Mindanao, Guiza noted. There were 23 quarantine checkpoints to ensure the outbreak would not spread to Bicol and further down south. “Kung walang quarantine checkpoints hindi na-contain ang pag-spread,” Guiza said. She noted that Typhoon Glenda (Rammasun) which hit the country in July last year, helped reduce the infestation. “The combined impact of IMP protocol and reduction of pest population due to Glenda considerably brought down the pest population at a level that bio-control can sustain,” Guiza said. Philippine Coconut Authority administrator Romulo Arancon Jr. said it will “essentially take two years before severely infested threes are back in production.” The government spent P177 million to treat 1,331,179 infested trees. “After the rapid ground assessment, a total of 1,186,242 CSI-infested trees were saved at a cost of P149 per tree,” Guiza said. In June 2014, some 2.1 million coconut trees, in Cavite, Laguna, Batangas, Quezon and Basilan, were infested. By August, the number rose to 2.7 million.